Stylesheet Maker by CoffeeCup is a CSS designer for those inexperienced with creating cascading style sheets. With the new era of CSS 3.0 and the web moving to a sleeker and faster model of design, CSS is important to your web site. Stylesheet Maker can create many CSS styles and works with divs, tables, backgrounds, page elements and anything else on a web page that can be styled (everything). 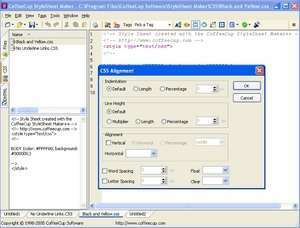 StyleSheet Maker 5.1 is a shareware program and can be used as a demo to try the software until the free trial period has ended. A full version of the program is available after the trial period ends. For security reasons, you should also check out the StyleSheet Maker download at LO4D.com which includes virus and malware tests. Additional screenshots of this application download may be available, too.